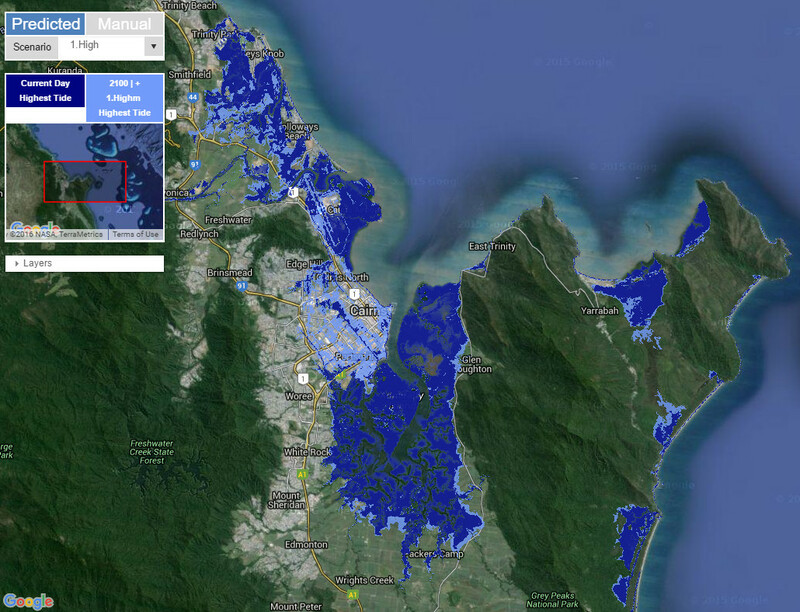 The Coastal Risk Australia website has been developed to help communicate the risks of coastal flooding associated with sea level rise and storm surge. There is robust evidence that sea levels have risen as a result of climate change based on observations from tide gauges, paleo indicators and satellite measurements. The Intergovernmental Panel on Climate Change (IPCC) Fifth Assessment Report found that over the last century global average sea level rose by 1.7 [1.5 to 1.9] mm per year. In recent years (between 1993 and 2010) this rate has increased to 3.2 [2.8 to 3.6] mm per year. The IPCC report finds that the rate of sea level rise over the last century is unusually high in the context of the last 2,000 years. Australia is a coastal society, 85 per cent of the population lives in the coastal region and it is of high economic, social and environmental value to the nation. Nearly 39,000 residential properties are located within 110 metres of soft, erodible shorelines. Exposure will increase as Australia's population grows. The impacts of sea level rise will be experienced mainly through its effect on extreme sea level events such as high tides and storm surges. Rising sea levels will increase the frequency or likelihood of extreme sea level events and resultant flooding. The inundation height for each area is computed using the above calculation. The default high tide level for each area is computed using the mean value of the virtual tide gauges hidden within the default view. To read more on the virtual tide gauges check the Guide, or to see them click on the tide gauges under the Layers panel. CRA allows users to investigate projected 2100 sea level rise scenarios for their locality. These scenarios are based on findings from the Intergovernmental Panel on Climate Change (IPCC) Fifth Assessment Report, and are expressed in terms of Representative Concentration Pathways (RCPs). The RCPs have become a standard way for discussing future emission scenarios. Below are three sea level rise scenarios which have been used in CRA. The values below have been obtained from the IPCC Fifth Assessment Report, Climate Change 2013: The Physical Science Basis, Chapter 13 Sea Level Rise, Table 13.5 Median Values and Likely Ranges for Projections of Global Mean Sea Level Rise. The low scenario considers sea-level rise in the context of a global agreement which would bring about dramatic reductions in global emissions. This low scenario, termed RCP 2.6, has a median sea level rise of 0.44 metres by 2100. The medium scenario considers sea-level rise where global emissions stabilise after 2100. This medium scenario aligns approximately to RCP 4.5 and RCP 6.0, which have median sea level rises of 0.53 metres and 0.55 metres respectively by 2100. In CRA we have combined these scenarios for simplicity, and used the mean value of 0.54 metres. The high scenario is in line with recent global emissions and observations of sea-level rise. This high scenario aligns to RCP 8.5, which has a median sea level rise of 0.74 metres by 2100. People overwhelming want to know whether the tide will affect them. This means that a high tide needs to be used in addition to the sea level rise scenario to give an estimate of the of inundation extent. 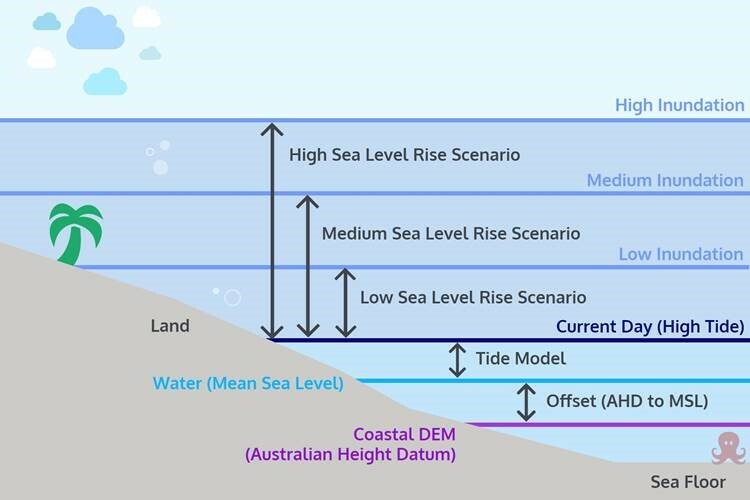 So in addition to the sea level rise scenarios, CRA uses a network of “virtual tide gauges” which provide estimates for the heights of high tide along the Australian coast. The technical level for the high tide used in CRA is the highest astronomical tides (HAT). The HAT values along the Australian coast have been computed from the CANUTE tide model relative to mean sea level. The CANUTE model has been developed by the Antarctic Climate and Ecosystems Cooperative Research Centre (ACE CRC) and provides estimates for 12,000 ‘virtual tide gauges’ spaced approximately every 2.5km around the coast. Whilst the tide is modelled relative to mean sea level (MSL), the DEMs are modelled relative to the Australian height datum (AHD). AHD was established using MSL values for 1966-1968 for 30 tide gauges around the coast of Australia. Since the establishment of AHD MSL has increased by approximately 3-4cm around the Australian coast. Whilst there is variation locally around the coast, a national average has been added into the scenarios to account for this historical increase. The DEMs are 3D models of the land which are used to compute the low-lying areas susceptible to inundation. The DEMs have been mapped in great detail using airborne LiDAR technology. The DEMs used in CRA have a resolution of 5m, or in other words, a height value for every 5m along the Australian coast. To get access to the Australian Coastal DEM or find out more about LiDAR technology go to Further Information under the Useful Links on CRA.